Meet “Petunia.” She’s 2 (in dog years), very loyal (to me, which is a first) and loves Dostoesvsky and Millhauser, but can find no connection (yet) between the two. We rescued her through SD Bulldog Rescue. They found her wandering the streets of Escondido, CA. She was emaciated and had huge, open sores all along her spine. She’s recovered amazingly well. Rich, You know this will only encourage Gary. Now he will be writing aphorisms about/by Petunia. Trouble in our house now! Someone noticed that Petunia has a matching food dish and water dish. Thank you! 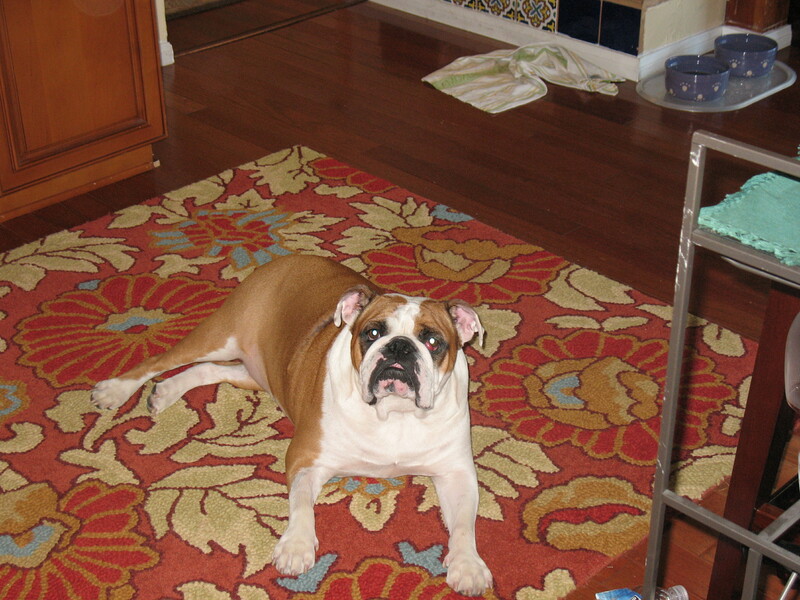 I doubt you have the requisite bulldog slobber rag next to the bowls though. At my age, the less said about slobber rags the better. Ok, I admit she has a certain strange beauty. I’m still waiting for Gary to write an aphorism about her. An aphorism is a lucky, sad dog saved from death by a human loving enough to overlook piffles like a little slobber. Tolstoy always gets passed up by dogs . . .
Hmmm, good point, Mary. What else do dogs ignore? The post doesn’t mention that Petunia likes this guy Glover even though there are dogs in his books! Petunia sat down with ‘Elle’ tonight. She’s working her way through the Glover canon, but the slobber tends to run the ink. Oh that we had a Kindle! You know, Rich, somehow the slobber thing kind of ruins the sentiment. Or maybe you mean she is digesting the book?